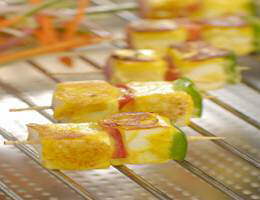 Cottage cheese and cubes of bell pepper marinated in a paste of yoghurt and spices,skewered and grilled. Transfer it into a bowl. Add yogurt, roasted cumin powder, crushed black peppercorns, kasoori methi, turmeric powder, garam masala powder, lemon juice, salt and saffron (if using) and mix well. Add the paneer pieces and toss gently and set aside to marinate for ten to fifteen minutes. Take satay sticks. Arrange marinated ingredients in the following order: onion, paneer, green capsicum, red capsicum, paneer, onion. Repeat for the other sticks. Heat a shallow pan, drizzle some oil and place the satay sticks on it. Cook turning the satay sticks from time to time so that the paneer pieces are cooked with even colour.